Italian bugloss scientifically known as Anchusa azurea is a species of flowering plant in the family Boraginaceae, known by the common names Garden anchusa, Italian alkanet, Italian bugloss, Large blue alkanet, Italian anchusa, Lengua de vaca and summer forget me not. It is a bristly perennial which reaches just over half a meter in height. The plant is native to central, southern, and Western Europe, northern Africa and western Asia, although it also grows naturalized in northern Europe. Other places we find it are Pakistan, Cypress, Russia, and Turkey. Apart from that the plant is well-known elsewhere as a noxious weed. Genus name comes from the Greek word ankousa in reference to a root pigment which was once used as a cosmetic paint for staining the skin. Specific epithet comes from the Latin word azureus meaning sky blue in reference to flower color. Alkanet is a red dye made from the roots of some plants in the genus Anchusa. In Crete it is called agoglossos (Greek: αγόγλωσσος) and the locals eat the tender stems boiled, steamed or fried. Italian bugloss is a coarse, hairy, spring-blooming, clump-forming, short-lived, herbaceous, perennial and bristly plant that grows up to 1–1.5 m high. The plant is found growing in sides of arable fields, waste places, roadsides and steppes on stony hills and occasionally in scrub lands. The plants require excellent drainage, but avoid dry soils. It loves deep, rich, fertile soils, but is more invasive therein and tends to grow taller and flop more. The plant has deep taproot and stems are simple, 20 – 150 cm high, erect, most often at the base with leaf rosette. Green, simple leaves are alternate. They are lanceolate, entire and partly clasping. 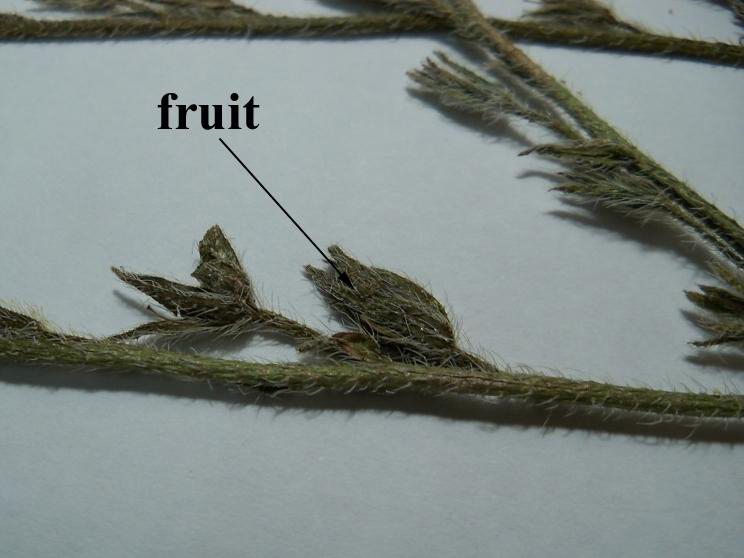 The surface of the leaves is hairy. The lower leaves are petiolate, 30 cm long, while the apical ones are sessile and smaller. Flowers are bright blue or violet, with a white center, forming loose racemes (cymes). They are 5-lobed, with densely hairy protuberances in the insertion of the calyx. Calyx 6 – 10 mm, in the fetus to 12 – 15 (16) mm long, divided to the base; shares linear, linear lantce or linear elliptical, covered with protruding, dense white hairs. Corolla is purple or dark blue. Tube is 6 – 10 mm and slightly exceed the calyx or shorter than it, the extended portion 10 -15 mm in diameter, round units. The bar is shorter than the calyx, apparently after loss of corolla. Stamens are attached on top of the tube, overlapping scales gum. Flowering normally takes place from June to August. 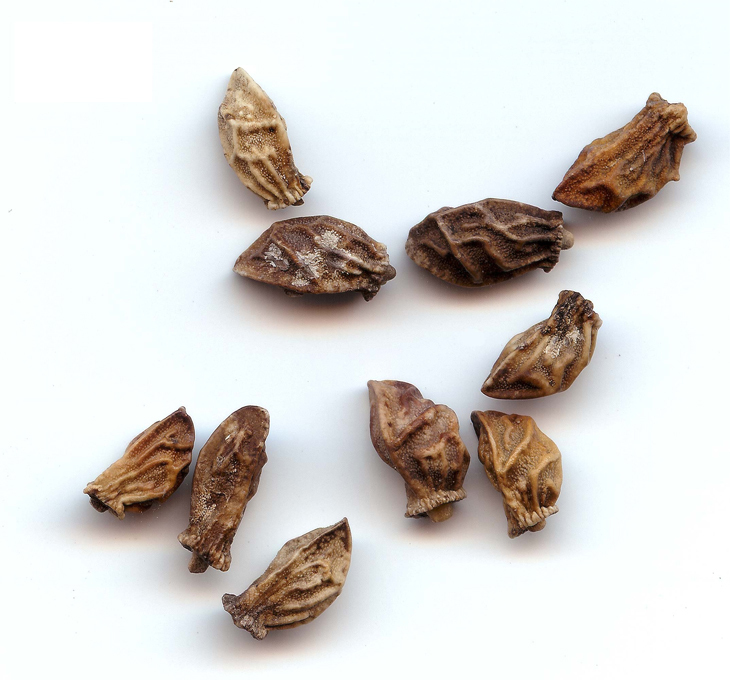 Flowers are followed by nuts 7 – 10 mm in length and 2 – 3 mm wide, extended ovoid, erect, a grid incorrect wrinkled, wrinkles between finely roughened. Though the leaves of this species were certainly used as a vegetable since ancient times, the oldest reference we have found is from a Spanish botanist of the seventeenth century (Cienfuegos 1627). He mentioned that this species, called lengua de buey or lenguaza, together with other wild vegetables, was consumed like spinach particularly in times of scarcity. However, the species of this genus were well known in the antiquity for their red roots, which were used as cheek coloring for women. Dioscorides also commented the astringent properties of the root that was good for skin problems, such as burns, ulcers, or erysipela. As mentioned before, some of these uses have prevailed in Spain since the past century. 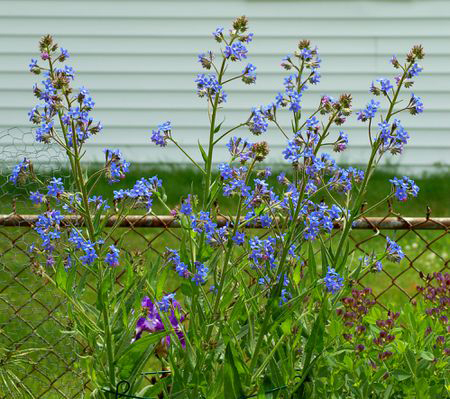 Italian bugloss plant has found a use since the olden times for treating numerous complaints. The medical properties are due to presence of polyphenols, triterpenes, tannins, and alkaloids. Here is a look at some of its benefits. 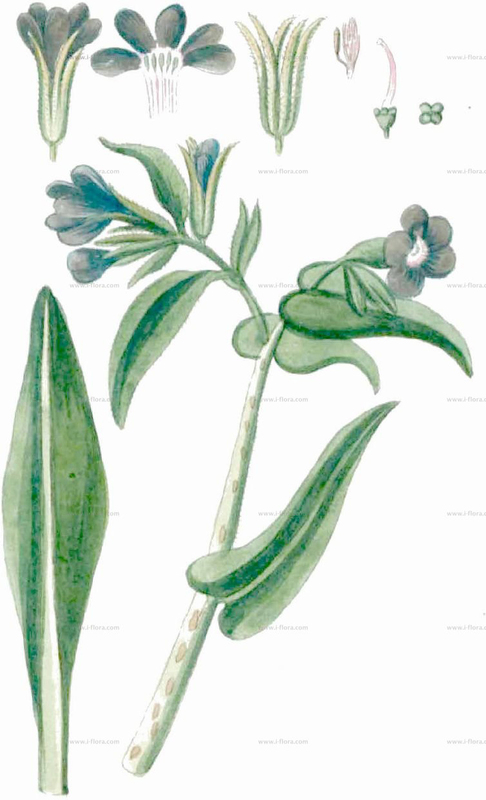 An extract of the leaves of Anchusa italica has a use to treat coughs and colds. If one has a cough, drink a glass of an infusion of the leaves in the morning. It will relieve your cough. The Italian alkanet has this property of purifying or detoxifying your body. Consuming a decoction made from the flowers along with dried leaves will help to make us strong so one is able to resist diseases. You will avoid fluid retention through the use of diuretics. You will urinate more so this will eliminate toxic substances from your body. But, be careful about taking too much. Even nutrients such as potassium or sodium get removed. This may lead to dizziness or vomiting. People with kidney or bladder stones will get relief by doing this. Poultice made from crushed leaves or flowers of the plants is used to treat inflammations. Due to its anti-inflammatory nature, you can use it to get relief from gout or arthritis. Juice made using Anchusa italica revitalizes you. It offers energy to reduce fatigue. It is good for general debility. The plant is rich in mucilage that helps calm internal tissues. It protects your tissues from irritation so it will provide much relief. It finds much benefit for people with bilious complaints. One can get relieved of your fever by having a decoction of the leaves twice a day. 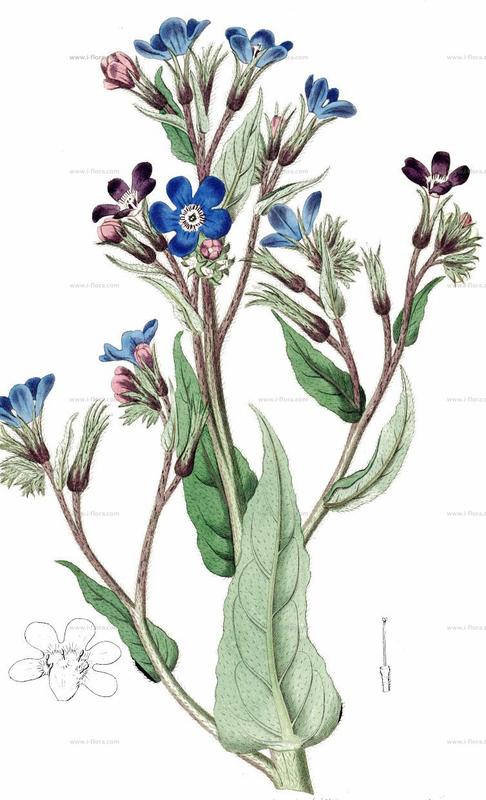 The anchusa italica has an antipyretic nature that puts down fevers fast. Good diet is useful for improving conditions for asthma patients. Take a decoction made from the leaves of garden anchusa both morning and evening. This will help relieve your asthma. Substance that makes us sweat is a diaphoretic. These increase dilation of surface capillaries thus increasing the amount we sweat. Another method diaphoretics use is to decrease the surface tension of your pores. This will improve sweating. This process helps improve detoxification so it aids in weight loss. Drink a decoction of the leaves twice a day to lose weight. Narcotics are medications to relieve pain. We use narcotics only when ordinary pain relievers do not have enough effect. Use a decoction of the flowers for providing relief from pain. An extract from these plants help in treating people with ankylosing spondylitis, rheumatoid arthritis, systemic lupus erythematosus, or psoriatic arthritis. Sometimes, they give NSAIDs or painkillers for treating these symptoms. An infusion of the leaves helps people with these symptoms. This is a purging or purifying action that comes about through the release of tensions and emotions. Any substance that speeds up excretion has a cathartic action. 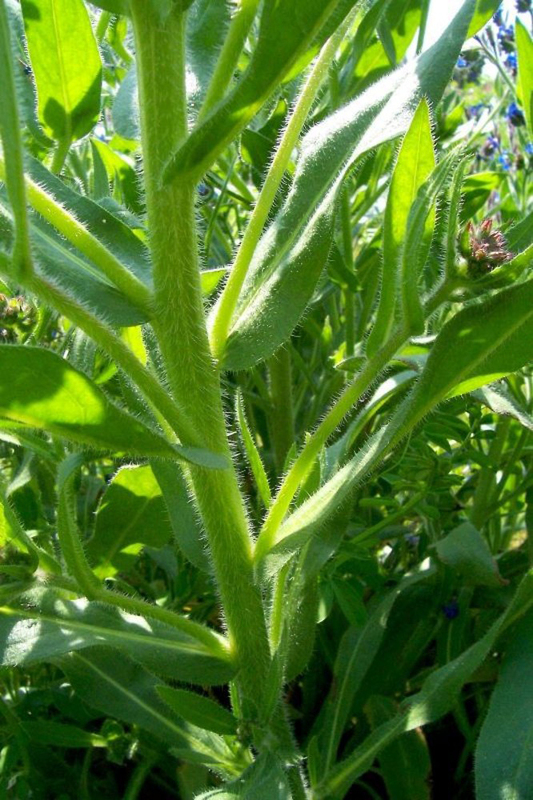 One can use Anchusa italica to remove tensions and improve your digestive process. 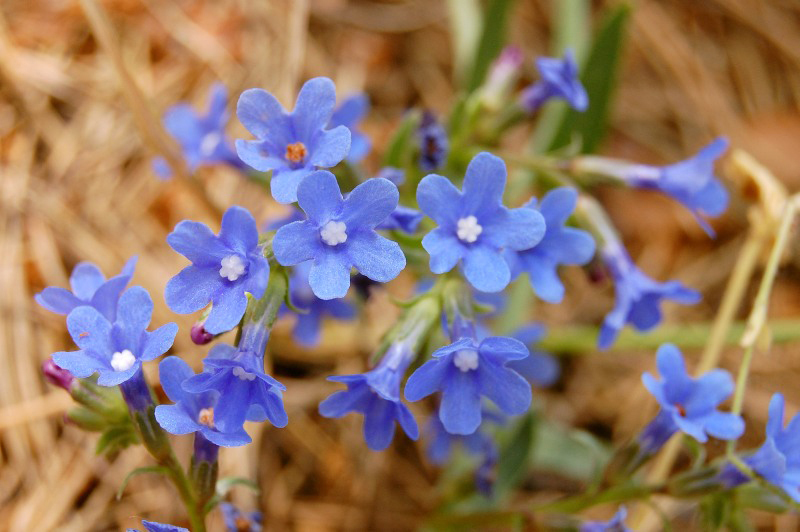 When we have chest pain, drink a glass of the juice of anchusa azurea. This pain will resolve instantly. Healing property of this plant helps wound healing; it also helps to treat ulcers. Because of its tranquilizing nature and tonic properties, it helps make the patient calm. It gives relief to people with abdominal pain. Drink one glass of decoction morning and evening to get good relief. 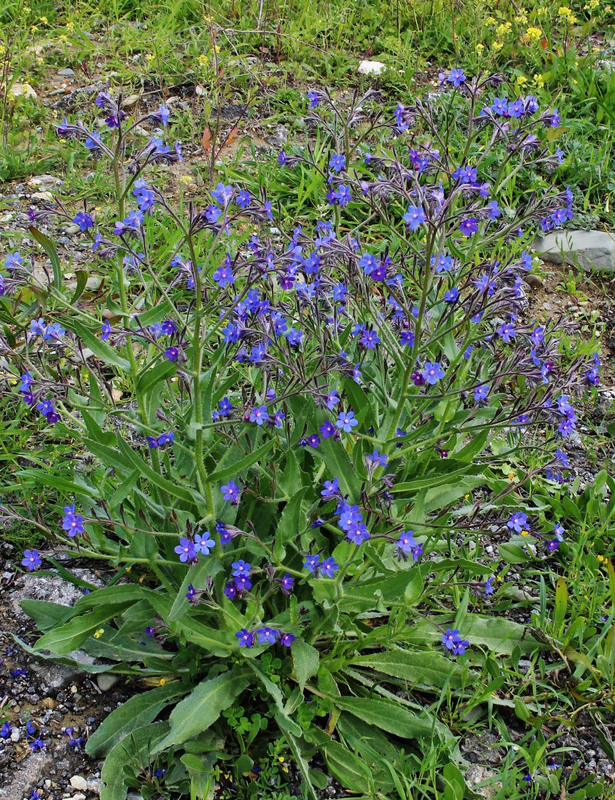 Due to its antioxidant nature, Anchusa italica plant gives a protective action against oxidative stress. All free radicals get prevented from destroying good body cells during any metabolic process. Use of an extract of the plant is beneficial for the re-absorption of water by the tubules of the kidneys. It helps maintain homeostasis in our body. 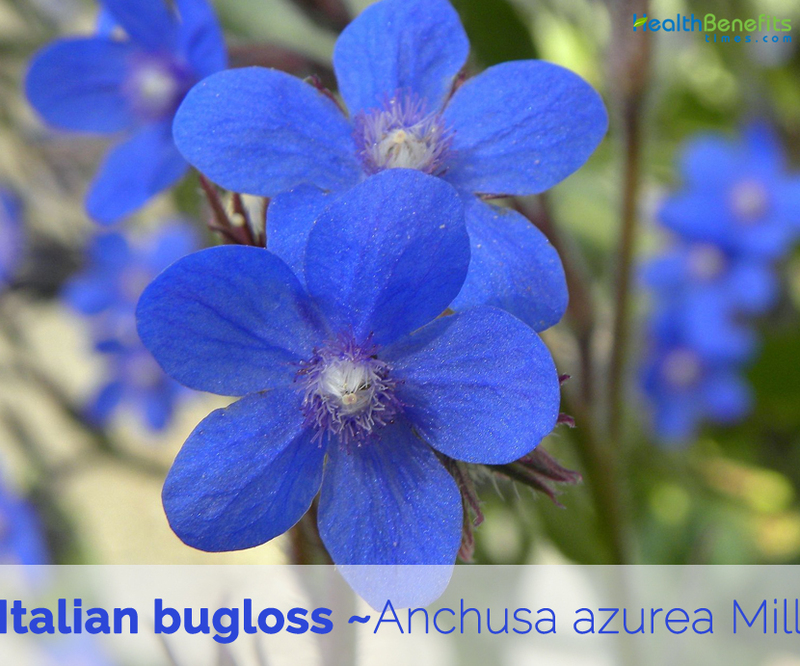 Decoction of the flowers and leaves of anchusa azurea plant helps maintain your blood sugar levels. This is helpful for diabetic patients. Plant has a property of lowering our blood pressure. People with high blood pressure will benefit by having a glass of juice made with flowers of the plant. Whole plant is antitussive, depurative, diaphoretic and diuretic. Dried and powdered herb is used as a poultice to treat inflammations. Use of the crushed root against bleeding and for healing wounds seems to have been extended in the past, at least in the south of Spain. It has also been used for its anti-inflammatory properties, against snake bites, and, less frequently mentioned, against animal and human respiratory complaints. People consider the consumption of the cooked leaves or roots is helpful against kidney stones. Flowers are excellent and decorative addition to the salad bowls, or used as a garnish. Tender young leaves and young flowering shoots can be cooked and eaten as a vegetable. This species have been traditionally consumed as vegetable in some Mediterranean countries, such as Spain. There are also references of the consumption of the young flowering shoots and even the roots. Whole leaves are usually cooked, either alone or included in mixed vegetable recipes with up to 20 wild vegetables, as recorded in Spain and Morocco. In the south of Spain, the midribs of the leaves, the young shoots and even the roots are consumed as fritters, battered and fried in olive oil. Red dye is obtained from the root. This was at one time used as a basis for some cosmetics. Remove withered flowers after flowering if no self-seeding is desired. Remove withered flowers regularly to prolong flowering. Aerial part cooked and mixed with flour or bread waste was widely used to feed animals in southern Spain, especially turkeys. 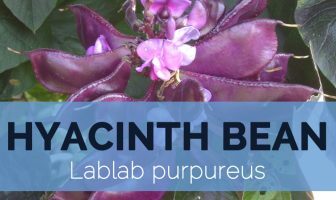 Use internally with caution, the plant contains the alkaloid cynoglossine which can have a paralyzing effect. Anchusa italica var. macrocarpa (Boiss. & Hohen.) Gușul. Anchusa macrocarpa Boiss. & Hohen. Calories 24 K cal. Calories from Fat 4.86 K cal.